This is my second book for the Clear Off Your Shelves Challenge! I’m doing rather well, if I say so myself as I’m now reading my third book for the challenge, A Grave Man by David Roberts, which is also from my TBR shelf. Way to go! 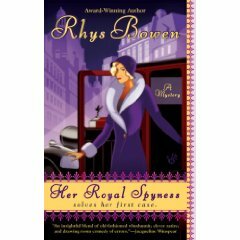 Her Royal Spyness by Rhys Bowen is a clever romp through interwar Britain with a plucky and likeable protagonist, Lady Georgie, who is half royal on her father’s side (Queen Victoria is grandmama) and half working class on her mother’s side (actress/bolter and granddad is a former copper). An interesting combination which gives Rhys Bowen a license to talk about the various aspects of British life and culture in the 1930s. Lady Georgie is 34th in line to the throne and living with her step-brother in his Highland castle. As she is of marriageable age, her family are trying to marry her off to some suitably obscure royal but she has other ideas. She goes to London to try her hand at independant living, learning how to light fires and make toast. When she finds a dead body in the bath and her family is implicated, she must learn to uncover who is trying to bring them down and, more importantly, stay alive. On top of that, she has been assigned a task by her grandmother, Queen Victoria, and is sent off to a house party in the country to spy on her son who is besotted with a certain married American lady. Her Royal Spyness is not too dark and was actually quite funny. I loved Bowen’s description of Georgie’s step-brother’s Scottish castle with draughty bathrooms and tartan wallpaper. Hilarious. The only thing that jarred was Georgie’s awareness of the poor, unemployed and disenfranchised, queuing at the soup kitchens. Would she really have noticed? But then she comes from a mixed class background and would be aware of the differences even within her own family. But that’s a small quibble in what was an enjoyable read. This is the first book in a series, so I’m looking forward to reading more about Lady Georgie and her antics. It rather drew a comparison to Miss Pettigrew Lives for a Day which I loved, but which was much darker and wasn’t a mystery. I’ve only seen the film but plan to read the book one of these days. Oh this sounds intriguing, especially with the Miss Pettigrew Lives for a Day comparison! I must look out for this. I haven’t read Miss Pettigrew Lives for a Day yet, so I’m not sure how it will compare to the actual book. This was a light and easy read, but was filled with lots of interesting information about the 1930s which I always enjoy reading about. I’m glad you enjoyed Her Royal Spyness. As for not noticing the lines at soup kitchens, Georgie could hardly fail to notice them. There were soup kitchens at the big London stations so she’d have to walk past those lines of dejected men and women as she left her train. And having come from her situation in Scotland, they would make an even bigger impression. Thank you for your enlightening comment. I’m still learning about the interwar years and try to read as many books and watch as many documentaries as I can (even though I spent years studying the thirties as a postgrad, I was concentrating more on the history of science rather than social history so have a lot of catching up to do). And because I’m interested in the era, anything that adds to my knowledge is always welcome and a great bonus. I’m looking forward to reading the next book in the series and also your Molly Murphy series.